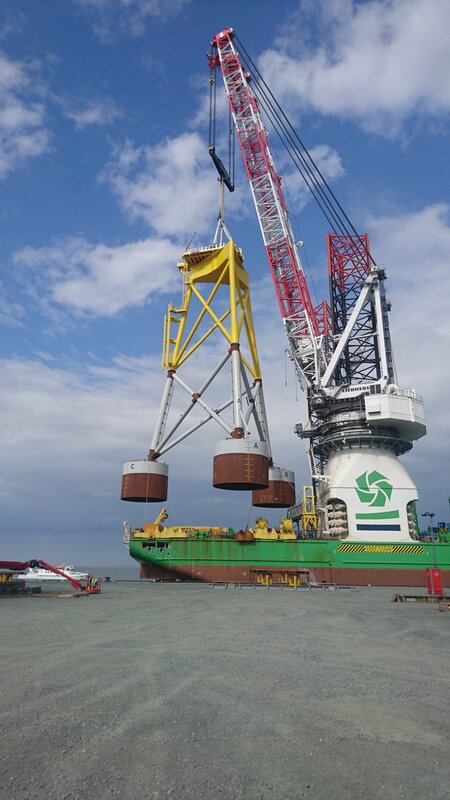 A team of specialists from Framo, the Norwegian Geotechnical Institute (NGI) and GeoSea installed the first of the 20 suction bucket jackets at the offshore wind farm. After periods of storm and high waves, the foundations of all 20 wind turbines were safely pumped into the seabed with the final jacket foundation. The full commissioning of the wind farm is planned for early 2019. “The suction bucket jacket technology for offshore wind farms has gone from concept to reality during the last five years. Besides lowering costs due to the increased installation speeds compared to traditionally piled jackets, the concept provides for easier decommissioning and practically noise free installation.” added Thomas Langford, Director for Offshore Energy at NGI. NGI and Framo have collaborated on the installation of offshore anchoring and foundation elements using suction/vacuum since the 1990s.The technology of suction and bucket foundation has been used to secure and safely anchor platforms and offshore installations around the world. Now larger wind farms are being built with this technology. The foundation is installed by pumping water out of the buckets. This creates a suction/vacuum, which press the buckets into the seabed. The windfarm Borkum Riffgrund 2 is located 54 kilometers off the coast of Lower Saxony, in the German North Sea. In the installation of the 56 wind turbines, 20 will use the suction bucket technology as foundation and 36 will be supported using monopiles. The three-legged foundations measure more than 50 meters in height and weighing 950 tons each. “Compared with installing monopiles, suction anchor technology has a more environmentally friendly footprint. When pumped in place, the fish are not scared away during the installation process due to noise and it is easy to reverse the operation.” said Theodorsen. When the 8.5 megawatt giant turbines are in place, they will rise 109 meters above sea level and have a wing span of 164 meters.